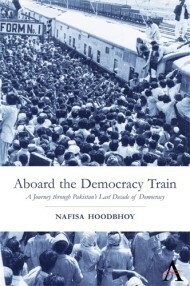 I borrowed the first half of topic today from the title of Nafisa Hoodbhoy’s book launched recently in Pakistan. In this nearly biographic work, she narrates her voyage as a journalist and activist in the 80s and 90s which I found particularly valuable for understanding the complexities of a fragile democratic arrangement that emerged after the sudden death of General Ziaul Haq. She extensively records incidents to explain where and how Pakistan started losing out to trends; in violence, especially against the weaker sections of society; and corruption; inefficient political organisation as well as the political intrusions by the establishment. With vast exposure particularly in Sindh but generally throughout the country, Nafisa presents case studies of several human rights violations including her own case when she became a victim of brazen political violence. She is explicit in naming names and pointing the finger at characters which helps readers understand the nature of challenges that persist today. Alongside her core suggestion about strengthening the democratic order, she is satisfied with the emerging prospects of eliminating extremism. Parallel to forces on the opposite side, yearning for democracy has been a hallmark of Pakistanis. The masses that filled the streets for the restoration of the judiciary during most of the year 2007 were mesmerised by Aitzaz Ahsan’s famous poem Riasat hogi maanke jaisi suggesting that a democratic state will be benevolent like a mother. Besides its idealistic vision, the poem emphasized the justice system and reforms therein which form the basis of a stable democracy. Nevertheless, the undemocratic rules left our institutions and systems ineffective, unable to deliver on the promises made by the elected governments or the expectations of the people. Today, we find institutions to be in a virtual dysfunction in major sectors like health, education and the justice system. On the other hand, the political stakeholders have been unwilling to allow some of the essentials of democracy; for instance, holding census and establishing local government. The elected governments achieved incremental progress on structural reforms through the 18th constitutional amendment, etc. However there was dismal progress regarding institutional and sectoral reforms. The failures in the structural reforms were attributable to the latter. An interaction with different ministries and line department brings home a stark realisation that the implementers and decision makers are suffering from inaptitude and indifference towards their responsibilities. The actors move only when there is a threat of losing their perks and privileges. The other tasks at hand can linger on for ages if the officers have an excuse to delay, defer or deny. Therefore, the objectors keep emphasising an improvement in governance. One solution was seen in building public-private partnership, which has worked only partially due to constraints on both sides, though notably because the bureaucracy accustomed to serving undemocratic regimes is failing to appreciate the nuance of a participatory democracy. Even able and well meaning officials are found nursing their demotivation and disillusionment. Some of them are even attracted to some kind of revolution. A section of politicians and bureaucracy are busy ensuring the third sector, or the NGOs are effectively alienated. Hence their expertise gained during decades in service delivery, development, disaster management and human rights advocacy is being under-utilised and wasted. Given the commendable achievements and sacrifices made for democracy throughout the history of Pakistan, these undesirable outcomes should make the stakeholders ponder over the details of the democracy project. We cannot afford to stay aboard a train that needs repairs. People at the helm need to capitalise on the wide consensus on democracy to expand the meaning and function of democracy from a majoritarian and functional democracy to an inclusive participatory and delivering democracy. The ongoing crackdown on civil society organisations, especially the smear campaign against NGOs, is a step in the opposite direction. While everyone should be accountable organisations, especially the smear campaign against NGOs, is a step in the opposite direction. While everyone should be accountable before the law, no one should be subjected to arbitrary actions without proof beyond doubt and due process of law. The people of Pakistan have paid a huge price to uncanny policies, indifference to people’s rights and lack of good governance. It is time to reverse the process, which is possible by allowing more civil rights, not the other way round. Subject to needs of lawful and reasonable scrutiny, a reduced civil space for NGOs is a space reduced for democracy in Pakistan. May the idealism for a better Pakistan featured in the works of Nafisa Hoodbhoy and Aitzaz Ahsan live on. This entry was posted in ATDT in Media and tagged Quetta book launch. Bookmark the permalink.